'Twas a cold, lonely evening in Gloom Mansion. All members of the household were asleep in their beds. Nancy, the mansion’s maid, was happily in between her covers, resting after a long day of cleaning and serving the Von-Vindersteins. After a long day, she decided to sleep in her birthday suit, just for fun. The air was still and everything seemed to be perfectly normal within the humble abode, when all of the sudden, something seemed bizarre and abnormal. The room turned completely upside-down! The bed, table and clothes rack, which stayed perfectly stationed to the floor, had taken a 180 degree turn. The lights flickered, the wind moaned outside, and the helpless maid scrambled on her mattress trying to find any reasoning as to what just happened. She started to yell for her partner, Bill Tracy, who was the mansion’s butler. With no response, she continued to kick and scream in place as she figured out that she could not release her physical being from the bed itself. To this day, she lay in her twin bed, upside-down, in sheer panic, as she awaits someone to offer her assistance. Maybe, you can help her as your car creeps by this crooked, helter-skelter room inside this manor. The Upside-Down Room resembles a tremendous amount of effort, not only in detail work and art, but in the design of the room itself. It was built in place as the Upside-Down Room, and required workers to slant the floor and ceiling inward to allow the vessel to lean to the left as you pass by. As you turn right out of the spinning tunnel, you look forward to see darkness and Tracy’s famous slanted lines on the wall ahead. 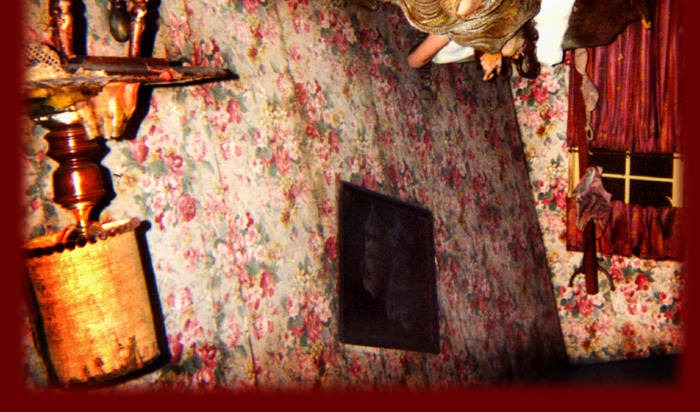 But then, as your car activates a switch, an old, dusty bedroom lamp clicks on to reveal this topsy-turvy room. You first notice a paramour in distress as she lay in her bed. Her covers, which are made of a hard resin to help keep their crinkly state, are thrown about. Her hand is not reaching out for help, but rather in a curious upward motion. Her lipstick is fresh, and her hair seems to be “done up” as if though she just returned from a gala. What makes this stunt so unique and controversial perhaps, are the contents on the clothes rack. That Tracy sure did have some wild ideas. The rack contains nothing more than a pair of women’s underwear and a bra. Why the lady would take time to hang up her undergarments is anyone’s guess. But, this undoubtedly signifies that she is lying naked in this heap of haywire. 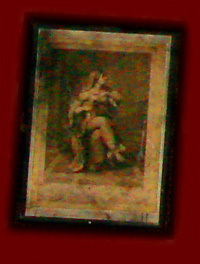 There are several old paintings hanging on the walls. Perhaps they are portraits of the former owners of the house, or current residents. One of the paintings is more religious in nature, and the others are more domestic. Nevertheless, they add curiosity and wonder to this stunt. 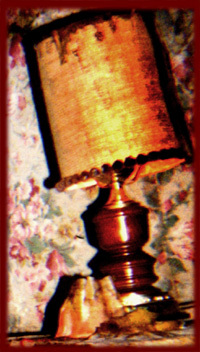 The old night stand, which holds the upside-down lamp, is complete with napery and several articles of which cannot be deciphered. Based on the condition of the lampshade, the room has been through some transmutation. The wallpaper is old, stained, and falling off. Of course, from an enthusiasts prospective, this wallpaper is original from when Tracy first built the ride in 1964, so it is entitled to look enfeebled. In fact, the older it looks the better; in a room that is “upside-down,” nothing would be perfect anyway. 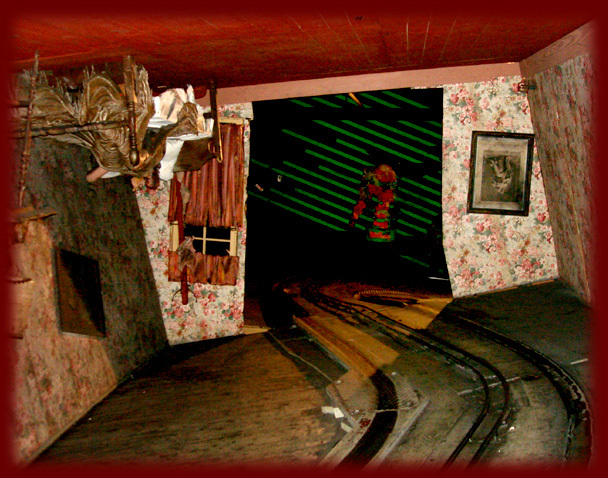 Although I have not run into any other Tracy attraction with a room such as this one, it is one of my favorite parts of the ride, and adds a tremendous amount of character and individuality to this attraction. Many people I talk to remember the Upside-Down Room, and it sticks out in their minds as being one of the more effective stunts in the ride. I am happy to see that this room has not been altered or done away with thus far.